In the Gospel of John, the voice of the Word is heard; the Paraclete is speaking. God makes himself known, proffers himself, and so becomes our God. Thus, the Gospel invites us to see and to hear what apart from the Gospel cannot be seen and cannot be heard: the Father of Jesus, who is the true and divine Son. 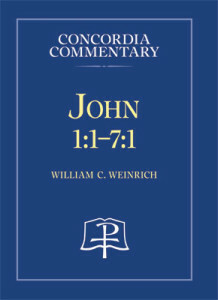 Concordia Commentary: John 1:1–7:1 contains Dr. William Weinrich’s original translation of John 1:1–7:1, a painstaking verse-by-verse analysis of the Greek text of these chapters, and theological exposition of the Gospel’s message, both for the apostolic church in its original context, and for the life of the Christian church today. His expertise in the early church fathers demonstrates how this Gospel was understood from the earliest times in the infant Christian church. The following excerpt from the commentary examines Jesus' words in John 6:54. Jesus elaborates his previous words of Jn 6:51. He first restates them negatively in Jn 6:53, then positively in Jn 6:54. In doing so, however, he introduces important variations. 1. The most important is that Jesus now speaks not only of one “eating” his “flesh” but also of one “drinking” his “blood.” The mention of “blood” alongside that of “flesh” suggests the separation of the two, that is, the flowing of blood from the flesh as the result of a violent death. Jesus will be slaughtered (“Lamb of God,” 1:29, 36). No doubt, therein lies the scandal of the cross: The “living Bread” (ὁ ἄρτος ὁ ζῶν) is none other than he who will be crucified (“lifted up,” 3:14). Indeed, the living Bread which comes down from heaven is life-giving only by way of the shedding of blood. The “living Bread” will be a sacrifice. These (Ex 24:3–8; Jer 31:33–34) are the very texts that lie behind Jesus’ words recorded in the institution narratives of the Synoptic Gospels: “this is my blood of the covenant, which is poured out for the forgiveness of sins” (Mt 26:28); “this is my blood of the covenant, which is poured out for many for the forgiveness of sins” (Mk 14:24); “this cup is the new covenant in my blood, which is poured out for you” (Lk 22:20). In the Gospel of John the new Torah is given in the death of Jesus. His death is the instantiation of God’s love for the world (Jn 3:16) and so is the establishment of the new commandment of love which is the fulfillment of the Torah (Jn 13:34–35; see also Mt 22:34–40; Rom 13:9–10; Gal 5:14). Therefore, to partake of this death is to be united to the love of God for the world. The believer becomes one with God in his love, and so loves the neighbor (see 1 Jn 4:7–10). Yet, love is the expression of the heart, that is, love expresses what defines a person. It is not circumstantial, therefore, that in Jn 6:53 those who “eat” and “drink” are said to “have life in yourselves” (ἐν ἑαυτοῖς). This phrase is elaborated in the reciprocal formula, “He who eats my flesh and drinks my blood remains in me and I in him” (Jn 6:56). 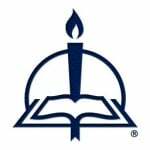 From Concordia Commentary: John 1:1–7:1, pages 732–35 © 2015 Concordia Publishing House. All rights reserved.